"Hegel" redirects here. For other uses, see Hegel (disambiguation). Georg Wilhelm Friedrich Hegel (/ˈheɪɡəl/, German: [ˈɡeːɔɐ̯k ˈvɪlhɛlm ˈfʁiːdʁɪç ˈheːɡl̩]; August 27, 1770 – November 14, 1831) was a German philosopher and an important figure of German idealism. He achieved wide recognition in his day and—while primarily influential within the continental tradition of philosophy—has become increasingly influential in the analytic tradition as well. Although Hegel remains a divisive figure, his canonical stature within Western philosophy is universally recognized. "The true is the whole"
Hegel's principal achievement was his development of a distinctive articulation of idealism, sometimes termed absolute idealism, in which the dualisms of, for instance, mind and nature and subject and object are overcome. His philosophy of spirit conceptually integrates psychology, the state, history, art, religion and philosophy. His account of the master–slave dialectic has been highly influential, especially in 20th-century France. Of special importance is his concept of spirit (Geist, sometimes also translated as "mind") as the historical manifestation of the logical concept and the "sublation" (Aufhebung, integration without elimination or reduction) of seemingly contradictory or opposing factors: examples include the apparent opposition between nature and freedom and between immanence and transcendence. Hegel has been seen in the 20th century as the originator of the thesis, antithesis, synthesis triad, but as an explicit phrase it originated with Johann Gottlieb Fichte. Hegel has influenced many thinkers and writers whose own positions vary widely. Karl Barth described Hegel as a "Protestant Aquinas" while Maurice Merleau-Ponty wrote that "all the great philosophical ideas of the past century—the philosophies of Marx and Nietzsche, phenomenology, German existentialism, and psychoanalysis—had their beginnings in Hegel." At the age of three, he went to the German School. When he entered the Latin School two years later, he already knew the first declension, having been taught it by his mother. In 1776, he entered Stuttgart's gymnasium illustre and during his adolescence read voraciously, copying lengthy extracts in his diary. Authors he read include the poet Friedrich Gottlieb Klopstock and writers associated with the Enlightenment, such as Christian Garve and Gotthold Ephraim Lessing. His studies at the Gymnasium were concluded with his Abiturrede ("graduation speech") entitled "The abortive state of art and scholarship in Turkey":16 ("den verkümmerten Zustand der Künste und Wissenschaften unter den Türken"). At the age of eighteen, Hegel entered the Tübinger Stift (a Protestant seminary attached to the University of Tübingen), where he had as roommates the poet and philosopher Friedrich Hölderlin and the philosopher-to-be Friedrich Wilhelm Joseph Schelling. Sharing a dislike for what they regarded as the restrictive environment of the Seminary, the three became close friends and mutually influenced each other's ideas. All greatly admired Hellenic civilization and Hegel additionally steeped himself in Jean-Jacques Rousseau and Lessing during this time. They watched the unfolding of the French Revolution with shared enthusiasm. Schelling and Hölderlin immersed themselves in theoretical debates on Kantian philosophy, from which Hegel remained aloof. Hegel at this time envisaged his future as that of a Popularphilosoph, i.e. a "man of letters" who serves to make the abstruse ideas of philosophers accessible to a wider public; his own felt need to engage critically with the central ideas of Kantianism did not come until 1800. Although the violence of the Reign of Terror in 1793 dampened Hegel's hopes, he continued to identify with the moderate Girondin faction and never lost his commitment to the principles of 1789, which he would express by drinking a toast to the storming of the Bastille every fourteenth of July. 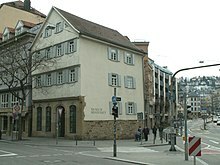 Having received his theological certificate (Konsistorialexamen) from the Tübingen Seminary, Hegel became Hofmeister (house tutor) to an aristocratic family in Bern (1793–1796). During this period, he composed the text which has become known as the Life of Jesus and a book-length manuscript titled "The Positivity of the Christian Religion". His relations with his employers becoming strained, Hegel accepted an offer mediated by Hölderlin to take up a similar position with a wine merchant's family in Frankfurt, to which he relocated in 1797. Here, Hölderlin exerted an important influence on Hegel's thought. :80 While in Frankfurt, Hegel composed the essay "Fragments on Religion and Love". In 1799, he wrote another essay entitled "The Spirit of Christianity and Its Fate", unpublished during his lifetime. Also in 1797, the unpublished and unsigned manuscript of "The Oldest Systematic Program of German Idealism" was written. It was written in Hegel's hand, but thought to have been authored by either Hegel, Schelling, Hölderlin, or an unknown fourth person. In 1801, Hegel came to Jena with the encouragement of his old friend Schelling, who held the position of Extraordinary Professor at the University there. Hegel secured a position at the University as a Privatdozent (unsalaried lecturer) after submitting the inaugural dissertation De Orbitis Planetarum, in which he briefly criticized arguments that assert - based on Bode's Law or other arbitrary choice of mathematical series - there must exist a planet between Mars and Jupiter. Unbeknownst to Hegel, Giuseppe Piazzi had discovered the minor planet Ceres within that orbit on January 1, 1801. Later in the year, Hegel's first book The Difference Between Fichte's and Schelling's Systems of Philosophy was completed. He lectured on "Logic and Metaphysics" and gave joint lectures with Schelling on an "Introduction to the Idea and Limits of True Philosophy" and held a "Philosophical Disputorium". In 1802, Schelling and Hegel founded a journal, the Kritische Journal der Philosophie (Critical Journal of Philosophy), to which they each contributed pieces until the collaboration was ended when Schelling left for Würzburg in 1803. I saw the Emperor – this world-soul [Weltseele] – riding out of the city on reconnaissance. It is indeed a wonderful sensation to see such an individual, who, concentrated here at a single point, astride a horse, reaches out over the world and masters it. In 1811, Hegel married Marie Helena Susanna von Tucher (1791–1855), the eldest daughter of a Senator. This period saw the publication of his second major work, the Science of Logic (Wissenschaft der Logik; 3 vols., 1812, 1813 and 1816), and the birth of his two legitimate sons, Karl Friedrich Wilhelm (1813–1901) and Immanuel Thomas Christian (1814–1891). Hegel published The Encyclopedia of the Philosophical Sciences in Outline (1817) as a summary of his philosophy for students attending his lectures at Heidelberg. In 1818, Hegel accepted the renewed offer of the chair of philosophy at the University of Berlin, which had remained vacant since Johann Gottlieb Fichte's death in 1814. Here, Hegel published his Philosophy of Right (1821). Hegel devoted himself primarily to delivering his lectures; and his lecture courses on aesthetics, the philosophy of religion, the philosophy of history and the history of philosophy were published posthumously from lecture notes taken by his students. His fame spread and his lectures attracted students from all over Germany and beyond. In 1819–1827, he made several trips to Weimar (twice), where he met Goethe, Brussels, the Northern Netherlands, Leipzig, Vienna through Prague and Paris. Hegel was appointed Rector of the University in October 1829, but his term as Rector ended in September 1830. Hegel was deeply disturbed by the riots for reform in Berlin in that year. In 1831, Frederick William III decorated him with the Order of the Red Eagle, 3rd Class for his service to the Prussian state. In August 1831, a cholera epidemic reached Berlin and Hegel left the city, taking up lodgings in Kreuzberg. Now in a weak state of health, Hegel seldom went out. As the new semester began in October, Hegel returned to Berlin with the (mistaken) impression that the epidemic had largely subsided. By November 14, Hegel was dead. The physicians pronounced the cause of death as cholera, but it is likely he died from a different gastrointestinal disease. He is said to have uttered the last words "And he didn't understand me" before expiring. In accordance with his wishes, Hegel was buried on November 16 in the Dorotheenstadt cemetery next to Fichte and Karl Wilhelm Ferdinand Solger. Hegel's son Ludwig Fischer had died shortly before while serving with the Dutch army in Batavia and the news of his death never reached his father. :548 Early the following year, Hegel's sister Christiane committed suicide by drowning. Hegel's remaining two sons—Karl, who became a historian; and Immanuel [de], who followed a theological path—lived long and safeguarded their father's Nachlaß and produced editions of his works. Hegel's thinking can be understood as a constructive development within the broad tradition that includes Plato and Immanuel Kant. To this list, one could add Proclus, Meister Eckhart, Gottfried Wilhelm Leibniz, Plotinus, Jakob Böhme, and Jean-Jacques Rousseau. What all these thinkers share, which distinguishes them from materialists like Epicurus and Thomas Hobbes and from empiricists like David Hume, is that they regard freedom or self-determination both as real and as having important ontological implications for soul or mind or divinity. This focus on freedom is what generates Plato's notion (in the Phaedo, Republic and Timaeus) of the soul as having a higher or fuller kind of reality than inanimate objects possess. While Aristotle criticizes Plato's "Forms", he preserves Plato's cornerstones of the ontological implications for self-determination: ethical reasoning, the soul's pinnacle in the hierarchy of nature, the order of the cosmos and an assumption with reasoned arguments for a prime mover. Kant imports Plato's high esteem of individual sovereignty to his considerations of moral and noumenal freedom as well as to God. All three find common ground on the unique position of humans in the scheme of things, known by the discussed categorical differences from animals and inanimate objects. In his discussion of "Spirit" in his Encyclopedia, Hegel praises Aristotle's On the Soul as "by far the most admirable, perhaps even the sole, work of philosophical value on this topic". In his Phenomenology of Spirit and his Science of Logic, Hegel's concern with Kantian topics such as freedom and morality and with their ontological implications is pervasive. Rather than simply rejecting Kant's dualism of freedom versus nature, Hegel aims to subsume it within "true infinity", the "Concept" (or "Notion": Begriff), "Spirit" and "ethical life" in such a way that the Kantian duality is rendered intelligible, rather than remaining a brute "given". The reason why this subsumption takes place in a series of concepts is that Hegel's method in his Science of Logic and his Encyclopedia is to begin with basic concepts like "Being" and "Nothing" and to develop these through a long sequence of elaborations, including those already mentioned. In this manner, a solution that is reached in principle in the account of "true infinity" in the Science of Logic's chapter on "Quality" is repeated in new guises at later stages, all the way to "Spirit" and "ethical life" in the third volume of the Encyclopedia. The result of this argument is that finite and infinite—and by extension, particular and universal, nature and freedom—do not face one another as two independent realities, but instead the latter (in each case) is the self-transcending of the former. :146 Rather than stress the distinct singularity of each factor that complements and conflicts with others—without explanation—the relationship between finite and infinite (and particular and universal and nature and freedom) becomes intelligible as a progressively developing and self-perfecting whole. The mystical writings of Jakob Böhme had a strong effect on Hegel. Böhme had written that the Fall of Man was a necessary stage in the evolution of the universe. This evolution was itself the result of God's desire for complete self-awareness. Hegel was fascinated by the works of Kant, Rousseau and Johann Wolfgang Goethe and by the French Revolution. Modern philosophy, culture and society seemed to Hegel fraught with contradictions and tensions, such as those between the subject and object of knowledge, mind and nature, self and Other, freedom and authority, knowledge and faith, or the Enlightenment and Romanticism. Hegel's main philosophical project was to take these contradictions and tensions and interpret them as part of a comprehensive, evolving, rational unity that in different contexts he called "the absolute Idea" (Science of Logic, sections 1781–1783) or "absolute knowledge" (Phenomenology of Spirit, "(DD) Absolute Knowledge"). According to Hegel, the main characteristic of this unity was that it evolved through and manifested itself in contradiction and negation. Contradiction and negation have a dynamic quality that at every point in each domain of reality—consciousness, history, philosophy, art, nature and society—leads to further development until a rational unity is reached that preserves the contradictions as phases and sub-parts by lifting them up (Aufhebung) to a higher unity. This whole is mental because it is mind that can comprehend all of these phases and sub-parts as steps in its own process of comprehension. It is rational because the same, underlying, logical, developmental order underlies every domain of reality and is ultimately the order of self-conscious rational thought, although only in the later stages of development does it come to full self-consciousness. The rational, self-conscious whole is not a thing or being that lies outside of other existing things or minds. Rather, it comes to completion only in the philosophical comprehension of individual existing human minds who through their own understanding bring this developmental process to an understanding of itself. Hegel's thought is revolutionary to the extent that it is a philosophy of absolute negation—as long as absolute negation is at the center, systematization remains open, and makes it possible for human beings to become subjects. "Mind" and "Spirit" are the common English translations of Hegel's use of the German "Geist". Some[who?] have argued that either of these terms overly "psychologize" Hegel, implying a kind of disembodied, solipsistic consciousness like ghost or "soul". Geist combines the meaning of spirit—as in god, ghost, or mind—with an intentional force. In Hegel's early philosophy of nature (draft manuscripts written during his time at the University of Jena), Hegel's notion of "Geist" was tightly bound to the notion of "Aether", from which Hegel also derived the concepts of space and time, but in his later works (after Jena) he did not explicitly use his old notion of "Aether" anymore. Central to Hegel's conception of knowledge and mind (and therefore also of reality) was the notion of identity in difference—that is, that mind externalizes itself in various forms and objects that stand outside of it or opposed to it; and that through recognizing itself in them, is "with itself" in these external manifestations so that they are at one and the same time mind and other-than-mind. This notion of identity in difference, which is intimately bound up with his conception of contradiction and negativity, is a principal feature differentiating Hegel's thought from that of other philosophers. Hegel made the distinction between civil society and state in his Elements of the Philosophy of Right. In this work, civil society (Hegel used the term "bürgerliche Gesellschaft" though it is now referred to as Zivilgesellschaft in German to emphasize a more inclusive community) was a stage in the dialectical relationship that occurs between Hegel's perceived opposites, the macro-community of the state and the micro-community of the family. Broadly speaking, the term was split, like Hegel's followers, to the political left and right. On the left, it became the foundation for Karl Marx's civil society as an economic base; to the right, it became a description for all non-state (and the state is the peak of the objective spirit) aspects of society, including culture, society and politics. This liberal distinction between political society and civil society was followed by Alexis de Tocqueville. In fact, Hegel's distinctions as to what he meant by civil society are often unclear. For example, while it seems to be the case that he felt that a civil society such as the German society in which he lived was an inevitable movement of the dialectic, he made way for the crushing of other types of "lesser" and not fully realized types of civil society as these societies were not fully conscious or aware—as it were—as to the lack of progress in their societies. Thus, it was perfectly legitimate in the eyes of Hegel for a conqueror such as Napoleon to come along and destroy that which was not fully realized. Hegel's State is the final culmination of the embodiment of freedom or right (Rechte) in the Elements of the Philosophy of Right. The State subsumes family and civil society and fulfills them. All three together are called "ethical life" (Sittlichkeit). The State involves three "moments". In a Hegelian State, citizens both know their place and choose their place. They both know their obligations and choose to fulfill their obligations. An individual's "supreme duty is to be a member of the state" (Elements of the Philosophy of Right, section 258). The individual has "substantial freedom in the state". The State is "objective spirit" so "it is only through being a member of the state that the individual himself has objectivity, truth, and ethical life" (section 258). Furthermore, every member both loves the State with genuine patriotism, but has transcended mere "team spirit" by reflectively endorsing their citizenship. Members of a Hegelian State are happy even to sacrifice their lives for the State. According to Hegel, "Heraclitus is the one who first declared the nature of the infinite and first grasped nature as in itself infinite, that is, its essence as process. The origin of philosophy is to be dated from Heraclitus. His is the persistent Idea that is the same in all philosophers up to the present day, as it was the Idea of Plato and Aristotle". For Hegel, Heraclitus's great achievements were to have understood the nature of the infinite, which for Hegel includes understanding the inherent contradictoriness and negativity of reality; and to have grasped that reality is becoming or process and that "being" and "nothingness" are mere empty abstractions. According to Hegel, Heraclitus's "obscurity" comes from his being a true (in Hegel's terms "speculative") philosopher who grasped the ultimate philosophical truth and therefore expressed himself in a way that goes beyond the abstract and limited nature of common sense and is difficult to grasp by those who operate within common sense. Hegel asserted that in Heraclitus he had an antecedent for his logic: "[...] there is no proposition of Heraclitus which I have not adopted in my logic". Being and non-being are the same. Heraclitus does not form any abstract nouns from his ordinary use of "to be" and "to become" and in that fragment seems to be opposing any identity A to any other identity B, C and so on, which is not-A. However, Hegel interprets not-A as not existing at all, not nothing at all, which cannot be conceived, but indeterminate or "pure" being without particularity or specificity. Pure being and pure non-being or nothingness are for Hegel pure abstractions from the reality of becoming and this is also how he interprets Heraclitus. This interpretation of Heraclitus cannot be ruled out, but even if present is not the main gist of his thought. For Hegel, the inner movement of reality is the process of God thinking as manifested in the evolution of the universe of nature and thought; that is, Hegel argued that when fully and properly understood, reality is being thought by God as manifested in a person's comprehension of this process in and through philosophy. Since human thought is the image and fulfillment of God's thought, God is not ineffable (so incomprehensible as to be unutterable), but can be understood by an analysis of thought and reality. Just as humans continually correct their concepts of reality through a dialectical process, so God himself becomes more fully manifested through the dialectical process of becoming. For his god, Hegel does not take the logos of Heraclitus but refers rather to the nous of Anaxagoras, although he may well have regarded them the same as he continues to refer to god's plan, which is identical to God. Whatever the nous thinks at any time is actual substance and is identical to limited being, but more remains to be thought in the substrate of non-being, which is identical to pure or unlimited thought. The universe as becoming is therefore a combination of being and non-being. The particular is never complete in itself, but to find completion is continually transformed into more comprehensive, complex, self-relating particulars. The essential nature of being-for-itself is that it is free "in itself;" that is, it does not depend on anything else such as matter for its being. The limitations represent fetters, which it must constantly be casting off as it becomes freer and more self-determining. Although Hegel began his philosophizing with commentary on the Christian religion and often expresses the view that he is a Christian, his ideas of God are not acceptable to some Christians even though he has had a major influence on 19th- and 20th-century theology. As a graduate of a Protestant seminary, Hegel's theological concerns were reflected in many of his writings and lectures. Hegel's thoughts on the person of Jesus Christ stood out from the theologies of the Enlightenment. In his posthumously published Lectures on the Philosophy of Religion, Part 3, Hegel is shown as being particularly interested with the demonstrations of God's existence and the ontological proof. He espouses that "God is not an abstraction but a concrete God [...] God, considered in terms of his eternal Idea, has to generate the Son, has to distinguish himself from himself; he is the process of differentiating, namely, love and Spirit". This means that Jesus as the Son of God is posited by God over against himself as other. Hegel sees both a relational unity and a metaphysical unity between Jesus and God the Father. To Hegel, Jesus is both divine and human. Hegel further attests that God (as Jesus) not only died, but "[...] rather, a reversal takes place: God, that is to say, maintains himself in the process, and the latter is only the death of death. God rises again to life, and thus things are reversed". In addition to his beloved Greeks, Hegel saw before him the example of Spinoza and, in his own time, the poetry of Goethe, Schiller, and Hölderlin, who also liked to speak of gods and the divine. So he, too, sometimes spoke of God and, more often, of the divine; and because he occasionally took pleasure in insisting that he was really closer to this or that Christian tradition than some of the theologians of his time, he has sometimes been understood to have been a Christian. According to Hegel himself, his philosophy was consistent with Christianity. This led Hegelian philosopher, jurist and politician Carl Friedrich Göschel [de] (1784–1861) to write a treatise demonstrating the consistency of Hegel's philosophy with the Christian doctrine of the immortality of the human soul. Göschel's book on this subject was titled Von den Beweisen für die Unsterblichkeit der menschlichen Seele im Lichte der spekulativen Philosophie: eine Ostergabe (Berlin: Verlag von Duncker und Humblot, 1835). Hegel seemed to have an ambivalent relationship with magic, myth and Paganism. He formulates an early philosophical example of a disenchantment narrative, arguing that Judaism was responsible both for realizing the existence of Geist and, by extension, for separating nature from ideas of spiritual and magical forces and challenging polytheism. However, Hegel's manuscript "The Oldest Systematic Program of German Idealism" suggests that Hegel was concerned about the perceived decline in myth and enchantment in his age, and that he therefore called for a "new myth" to fill the cultural vacuum. (1) The Phenomenology of Spirit (or The Phenomenology of Mind), his account of the evolution of consciousness from sense-perception to absolute knowledge, published in 1807. (2) Science of Logic, the logical and metaphysical core of his philosophy, in three volumes (1812, 1813 and 1816, respectively), with a revised first volume published in 1831. (3) Encyclopedia of the Philosophical Sciences, a summary of his entire philosophical system, which was originally published in 1816 and revised in 1827 and 1830. (4) Elements of the Philosophy of Right, his political philosophy, published in 1820. During the last ten years of his life, Hegel did not publish another book, but thoroughly revised the Encyclopedia (second edition, 1827; third, 1830). In his political philosophy, he criticized Karl Ludwig von Haller's reactionary work, which claimed that laws were not necessary. He also published some articles early in his career and during his Berlin period. A number of other works on the philosophy of history, religion, aesthetics and the history of philosophy were compiled from the lecture notes of his students and published posthumously. There are views of Hegel's thought as a representation of the summit of early 19th-century Germany's movement of philosophical idealism. It would come to have a profound impact on many future philosophical schools, including schools that opposed Hegel's specific dialectical idealism, such as existentialism, the historical materialism of Marx, historism and British Idealism. Hegel's influence was immense both within philosophy and in the other sciences. Throughout the 19th century many chairs of philosophy around Europe were held by Hegelians and Søren Kierkegaard, Ludwig Feuerbach, Karl Marx and Friedrich Engels—among many others—were all deeply influenced by, but also strongly opposed to many of the central themes of Hegel's philosophy. Scholars continue to find and point out Hegelian influences and approaches in a wide range of theoretical and/or learned works, such as Carl von Clausewitz's magnum opus on strategic thought, On War (1831). After less than a generation, Hegel's philosophy was suppressed and even banned by the Prussian right-wing and was firmly rejected by the left-wing in multiple official writings. After the period of Bruno Bauer, Hegel's influence did not make itself felt again until the philosophy of British Idealism and the 20th-century Hegelian Western Marxism that began with György Lukács. The more recent movement of communitarianism has a strong Hegelian influence. Some of Hegel's writing was intended for those with advanced knowledge of philosophy, although his Encyclopedia was intended as a textbook in a university course. Nevertheless, Hegel assumes that his readers are well-versed in Western philosophy. Especially crucial are Aristotle, Immanuel Kant and Kant's immediate successors, most prominently Johann Gottlieb Fichte and Friedrich Wilhelm Joseph Schelling. Those without this background would be well-advised to begin with one of the many general introductions to his thought. As is always the case, difficulties are magnified for those reading him in translation. In fact, Hegel himself argues in his Science of Logic that the German language was particularly conducive to philosophical thought. According to Walter Kaufmann, the basic idea of Hegel's works, especially the Phenomenology of Spirit, is that a philosopher should not "confine him or herself to views that have been held but penetrate these to the human reality they reflect". In other words, it is not enough to consider propositions, or even the content of consciousness; "it is worthwhile to ask in every instance what kind of spirit would entertain such propositions, hold such views, and have such a consciousness. Every outlook in other words, is to be studied not merely as an academic possibility but as an existential reality". Kaufmann has argued that as unlikely as it may sound, it is not the case that Hegel was unable to write clearly, but that Hegel felt that "he must and should not write in the way in which he was gifted". Some historians have spoken of Hegel's influence as represented by two opposing camps. The Right Hegelians, the allegedly direct disciples of Hegel at the Friedrich-Wilhelms-Universität, advocated a Protestant orthodoxy and the political conservatism of the post-Napoleon Restoration period. Today this faction continues among conservative Protestants, such as the Wisconsin Evangelical Lutheran Synod, which was founded by missionaries from Germany when the Hegelian Right was active. The Left Hegelians, also known as the Young Hegelians, interpreted Hegel in a revolutionary sense, leading to an advocation of atheism in religion and liberal democracy in politics. In more recent studies, this paradigm has been questioned. No Hegelians of the period ever referred to themselves as "Right Hegelians", which was a term of insult originated by David Strauss, a self-styled Left Hegelian. Critiques of Hegel offered from the Left Hegelians radically diverted Hegel's thinking into new directions and eventually came to form a disproportionately large part of the literature on and about Hegel. The Left Hegelians also influenced Marxism, which inspired global movements, encompassing the Russian Revolution, the Chinese Revolution and myriad revolutionary practices up until the present moment. 20th-century interpretations of Hegel were mostly shaped by British idealism, logical positivism, Marxism and Fascism. According to Benedetto Croce, the Italian Fascist Giovanni Gentile "holds the honor of having been the most rigorous neo-Hegelian in the entire history of Western philosophy and the dishonor of having been the official philosopher of Fascism in Italy". However, since the fall of the Soviet Union a new wave of Hegel scholarship arose in the West without the preconceptions of the prior schools of thought. Walter Jaeschke [de] and Otto Pöggeler in Germany as well as Peter Hodgson and Howard Kainz in the United States are notable for their recent contributions to post-Soviet Union thinking about Hegel. In previous modern accounts of Hegelianism (to undergraduate classes, for example), especially those formed prior to the Hegel renaissance, Hegel's dialectic was most often characterized as a three-step process, "thesis, antithesis, synthesis"; namely, that a "thesis" (e.g. the French Revolution) would cause the creation of its "antithesis" (e.g. the Reign of Terror that followed) and would eventually result in a "synthesis" (e.g. the constitutional state of free citizens). However, Hegel used this classification only once and he attributed the terminology to Kant. The terminology was largely developed earlier by Fichte. It was spread by Heinrich Moritz Chalybäus in accounts of Hegelian philosophy and since then the terms have been used as descriptive of this type of framework. The "thesis–antithesis–synthesis" approach gives the sense that things or ideas are contradicted or opposed by things that come from outside them. To the contrary, the fundamental notion of Hegel's dialectic is that things or ideas have internal contradictions. From Hegel's point of view, analysis or comprehension of a thing or idea reveals that underneath its apparently simple identity or unity is an underlying inner contradiction. This contradiction leads to the dissolution of the thing or idea in the simple form in which it presented itself and to a higher-level, more complex thing or idea that more adequately incorporates the contradiction. The triadic form that appears in many places in Hegel (e.g. being–nothingness–becoming, immediate–mediate–concrete and abstract–negative–concrete) is about this movement from inner contradiction to higher-level integration or unification. For Hegel, reason is but "speculative", not "dialectical". Believing that the traditional description of Hegel's philosophy in terms of thesis–antithesis–synthesis was mistaken, a few scholars like Raya Dunayevskaya have attempted to discard the triadic approach altogether. According to their argument, although Hegel refers to "the two elemental considerations: first, the idea of freedom as the absolute and final aim; secondly, the means for realising it, i.e. the subjective side of knowledge and will, with its life, movement, and activity" (thesis and antithesis), he does not use "synthesis", but instead speaks of the "Whole": "We then recognised the State as the moral Whole and the Reality of Freedom, and consequently as the objective unity of these two elements". Furthermore, in Hegel's language the "dialectical" aspect or "moment" of thought and reality, by which things or thoughts turn into their opposites or have their inner contradictions brought to the surface, what he called Aufhebung, is only preliminary to the "speculative" (and not "synthesizing") aspect or "moment", which grasps the unity of these opposites or contradiction. It is widely admitted today that the old-fashioned description of Hegel's philosophy in terms of thesis–antithesis–synthesis is inaccurate. Nevertheless, such is the persistence of this misnomer that the model and terminology survive in a number of scholarly works. In the last half of the 20th century, Hegel's philosophy underwent a major renaissance. This was due to (a) the rediscovery and re-evaluation of Hegel as a possible philosophical progenitor of Marxism by philosophically oriented Marxists; (b) a resurgence of the historical perspective that Hegel brought to everything; and (c) an increasing recognition of the importance of his dialectical method. György Lukács' History and Class Consciousness (1923) helped to reintroduce Hegel into the Marxist canon. This sparked a renewed interest in Hegel reflected in the work of Herbert Marcuse, Theodor W. Adorno, Ernst Bloch, Raya Dunayevskaya, Alexandre Kojève and Gotthard Günther among others. In Reason and Revolution (1941), Herbert Marcuse made the case for Hegel as a revolutionary and criticized Leonard Trelawny Hobhouse's thesis that Hegel was a totalitarian. The Hegel renaissance also highlighted the significance of Hegel's early works, i.e. those written before The Phenomenology of Spirit. The direct and indirect influence of Kojève's lectures and writings (on The Phenomenology of Spirit in particular) mean that it is not possible to understand most French philosophers from Jean-Paul Sartre to Jacques Derrida without understanding Hegel. American neoconservative political theorist Francis Fukuyama's controversial book The End of History and the Last Man (1992) was heavily influenced by Kojève. The Swiss theologian Hans Küng has also advanced contemporary scholarship in Hegel studies. Beginning in the 1960s, Anglo-American Hegel scholarship has attempted to challenge the traditional interpretation of Hegel as offering a metaphysical system: this has also been the approach of Z. A. Pelczynski and Shlomo Avineri. This view, sometimes referred to as the "non-metaphysical option", has had a decided influence on many major English language studies of Hegel in the past forty years. Late 20th-century literature in Western Theology that is friendly to Hegel includes works by such writers as Walter Kaufmann (1966), Dale M. Schlitt (1984), Theodore Geraets (1985), Philip M. Merklinger (1991), Stephen Rocker (1995) and Cyril O'Regan (1995). Two prominent American philosophers, John McDowell and Robert Brandom (sometimes referred to as the "Pittsburgh Hegelians"), have produced philosophical works exhibiting a marked Hegelian influence. Each is avowedly influenced by the late Wilfred Sellars, also of Pittsburgh, who referred to his seminal work Empiricism and the Philosophy of Mind (1956) as a series of "incipient Méditations Hegeliennes" (in homage to Edmund Husserl's 1931 work, Méditations cartésiennes). Beginning in the 1990s after the fall of the Soviet Union, a fresh reading of Hegel took place in the West. For these scholars, fairly well represented by the Hegel Society of America and in cooperation with German scholars such as Otto Pöggeler and Walter Jaeschke, Hegel's works should be read without preconceptions. Marx plays little-to-no role in these new readings. Some American philosophers associated with this movement include Lawrence Stepelevich, Rudolf Siebert, Richard Dien Winfield and Theodore Geraets. Criticism of Hegel has been widespread in the 19th and the 20th centuries. A diverse range of individuals including Arthur Schopenhauer, Karl Marx, Søren Kierkegaard, Friedrich Nietzsche, Bertrand Russell, G. E. Moore, Franz Rosenzweig, Eric Voegelin and A. J. Ayer have challenged Hegelian philosophy from a variety of perspectives. Among the first to take a critical view of Hegel's system was the 19th-century German group known as the Young Hegelians, which included Feuerbach, Marx, Engels and their followers. In Britain, the Hegelian British idealism school (members of which included Francis Herbert Bradley, Bernard Bosanquet and in the United States Josiah Royce) was challenged and rejected by analytic philosophers Moore and Russell. In particular, Russell considered "almost all" of Hegel's doctrines to be false. Regarding Hegel's interpretation of history, Russell commented: "Like other historical theories, it required, if it was to be made plausible, some distortion of facts and considerable ignorance". Logical positivists such as Ayer and the Vienna Circle criticized both Hegelian philosophy and its supporters, such as Bradley. Hegel's contemporary Schopenhauer was particularly critical and wrote of Hegel's philosophy as "a pseudo-philosophy paralyzing all mental powers, stifling all real thinking". In 1820, Schopenhauer became a lecturer at the University of Berlin and he scheduled his lectures to coincide with those of Hegel, whom Schopenhauer had also described as a "clumsy charlatan". However, only five students ended up attending Schopenhauer's lectures so he dropped out of academia. Kierkegaard criticized Hegel's "absolute knowledge" unity. The physicist and philosopher Ludwig Boltzmann also criticized the obscure complexity of Hegel's works, referring to Hegel's writing as an "unclear thoughtless flow of words". In a similar vein, Robert Pippin notes that some view Hegel as having "the ugliest prose style in the history of the German language". Russell wrote in A History of Western Philosophy (1945) that Hegel was "the hardest to understand of all the great philosophers". Karl Popper quoted Schopenhauer as stating, "Should you ever intend to dull the wits of a young man and to incapacitate his brains for any kind of thought whatever, then you cannot do better than give Hegel to read...A guardian fearing that his ward might become too intelligent for his schemes might prevent this misfortune by innocently suggesting the reading of Hegel." Karl Popper wrote that "there is so much philosophical writing (especially in the Hegelian school) which may justly be criticised as meaningless verbiage". Popper also makes the claim in the second volume of The Open Society and Its Enemies (1945) that Hegel's system formed a thinly veiled justification for the absolute rule of Frederick William III and that Hegel's idea of the ultimate goal of history was to reach a state approximating that of 1830s Prussia. Popper further proposed that Hegel's philosophy served not only as an inspiration for communist and fascist totalitarian governments of the 20th century, whose dialectics allow for any belief to be construed as rational simply if it could be said to exist. Kaufmann and Shlomo Avineri have criticized Popper's theories about Hegel. Isaiah Berlin listed Hegel as one of the six architects of modern authoritarianism who undermined liberal democracy, along with Rousseau, Claude Adrien Helvétius, Fichte, Saint-Simon and Joseph de Maistre. Voegelin argued that Hegel should be understood not as a philosopher, but as a "sorcerer", i.e. as a mystic and hermetic thinker. This concept of Hegel as a hermetic thinker was elaborated by Glenn Alexander Magee, who argued that interpreting Hegel's body of work as an expression of mysticism and hermetic ideas leads to a more accurate understanding of Hegel. ^ Timothy C. Luther, Hegel's Critique of Modernity: Reconciling Individual Freedom and the Community, Lexington Books, 2009, p. 98. ^ Brian K. Etter, Between Transcendence and Historicism, SUNY Press, 2006, p. 68. ^ James Kreines, Reason in the World: Hegel's Metaphysics and Its Philosophical Appeal, Oxford University Press, 2015, p. 21. ^ A. Sarlemijn, Hegel's Dialectic, Springer, 1975, p. 21. ^ Tom Rockmore, Before and After Hegel: A Historical Introduction to Hegel's Thought, Hackett Publishing, 2003, p. xviii: "Hegel follows Kant ... in limiting claims to know to the empirically real. In short, he adopts a view very similar to Kant's empirical realism." ^ Franz Wiedmann, Hegel: An Illustrated Biography, Pegasus, 1968, p. 23. ^ Routledge Encyclopedia of Philosophy (1998): "Alienation". ^ John Grier Hibben, Eric v. d. Luft, Hegel's Shorter Logic: An Introduction and Commentary, Gegensatz Press, 2013, p. 143. ^ Equivalently: the universal, the particular, and the individual (Allgemeines, Besonderes, Einzelnes). ^ Georg Wilhelm Friedrich Hegel: The Science of Logic, Cambridge University Press, 2010, p. 609. See also: Richard Dien Winfield, Hegel's Science of Logic: A Critical Rethinking in Thirty Lectures, Rowman & Littlefield Publishers, 2012, p. 265. ^ David Gray Carlson, A Commentary to Hegel's Science of Logic, Palgrave Macmillan, 2007, p. 38. ^ G. W. F. Hegel, Phänomenologie des Geistes (1807), Vorrede: "Das Wahre ist das Ganze." ^ G. W. F. Hegel, Vorlesungen über de Geschichte der Philosophie, Part 3, Duncker und Humblot, 1844, pp. 502 and 514. ^ George Kline, On Hegel, Gegensatz Press, 2015; Rugard Otto Gropp, Zu Fragen der Geschichte der Philosophie und des dialektischen Materialismus, Deutscher Verlag der Wissenschaften, 1958, p. 28. ^ Georg Wilhelm Friedrich Hegel, Wissenschaft der Logik Vol. II, Meiner, 1975 , pp. 466 and 474. ^ P. Stekeler-Weithofer (2016), "Hegel's Analytic Pragmatism", University of Leipzig, pp. 122–4. ^ Lom, Petr (2001). The Limits of Doubt: The Moral and Political Implications of Skepticism. SUNY Press. pp. 65–66. ^ MacGregor, David (2014). Hegel and Marx: After the Fall of Communism. University of Wales Press. p. 69. ^ Michael N. Forster, After Herder: Philosophy of Language in the German Tradition, Oxford University Press, 2010, p. 9. ^ Henderson, James P.; Davis, John B. (1991). "Adam Smith's Influence on Hegel's Philosophical Writings". Journal of the History of Economic Thought. 13 (2): 184–204. doi:10.1017/S1053837200003564. ^ Butler, Judith (1987). Subjects of desire: Hegelian reflections in twentieth-century France. New York: Columbia University Press. ^ Kelley, Donald R. (2017). The Descent of Ideas: The History of Intellectual History. Routledge. p. 29. ^ Hamburg, G. M. (1992). Boris Chicherin & Early Russian Liberalism: 1828 - 1866. Stanford University Press. p. 186. ^ "Hegel". Random House Webster's Unabridged Dictionary. ^ "Georg - Französisch-Übersetzung - Langenscheidt Deutsch-Französisch Wörterbuch" (in German and French). Langenscheidt. Retrieved 2018-10-18. ^ "Wilhelm - Französisch-Übersetzung - Langenscheidt Deutsch-Französisch Wörterbuch" (in German and French). Langenscheidt. Retrieved 2018-10-18. ^ "Friedrich - Französisch-Übersetzung - Langenscheidt Deutsch-Französisch Wörterbuch" (in German and French). Langenscheidt. Retrieved 2018-10-18. ^ Paul, Redding (13 February 1997). "Georg Wilhelm Friedrich Hegel". Stanford Encyclopedia of Philosophy. ^ This term is actually quite rare in Hegel's writings. It does not occur anywhere in The Science of Logic (though he comes close in a remark on p. 124 of the  di Giovanni translation, GW 21.142). In the Encyclopedia presentation of his logic it can be found only at §45R. Greraets, Suchting and Harris note in the introduction to their translation of this later text that the term is more strongly associated with English movement in that later part of the 19th century (Hackett: 1991, xiii). ^ Overwhelmingly due to Alexandre Kojève's influential lectures published as Introduction à la lecture de Hegel (Paris, 1947), selections translated into English by James Nichols as Introduction to the Reading of Hegel (New York, 1969). See, for instance, Aimé Patri, "Dialectique du Maître et de l’Esclave", Le Contrat Social, V, No. a (July–August 196r), 234, cited in Editor's Introduction (vii) on the extent of their influence. ^ Robert C. Solomon, In the Spirit of Hegel, Oxford University Press, p. 23. ^ "Review of Aenesidemus" ("Rezension des Aenesidemus", Allgemeine Literatur-Zeitung [de], February 11–12, 1794). Trans. Daniel Breazeale. In Breazeale, Daniel; Fichte, Johann (1993). Fichte: Early Philosophical Writings. Cornell University Press. p. 63. ^ "One of the few things on which the analysts, pragmatists, and existentialists agree with the dialectical theologians is that Hegel is to be repudiated: their attitude toward Kant, Aristotle, Plato, and the other great philosophers is not at all unanimous even within each movement; but opposition to Hegel is part of the platform of all four, and of the Marxists, too." Walter Kaufmann, "The Hegel Myth and Its Method" in From Shakespeare to Existentialism: Studies in Poetry, Religion, and Philosophy, Beacon Press, Boston, 1959 (pp. 88–119). ^ "Why did Hegel not become for the Protestant world something similar to what Thomas Aquinas was for Roman Catholicism?" (Karl Barth, Protestant Thought from Rousseau to Ritschl: Being the Translation Of Eleven Chapters of Die Protestantische Theologie im 19. Jahrhundert, 268 Harper, 1959). ^ Maurice Merleau-Ponty (trans. Herbert L. and Patricia Allen Dreyfus), Sense and Nonsense, Northwestern University Press, 1964, p. 63. ^ a b c d e f g h i j k l Pinkard, Terry (2000). Hegel: A Biography. Cambridge University Press. ISBN 978-0-521-49679-7. ^ Pinkard, Hegel: A Biography, p. 3, incorrectly gives the date as September 20, 1781, and describes Hegel as aged eleven. Cf. the index to Pinkard's book and his "Chronology of Hegel's Life", which correctly give the date as 1783 (pp. 773, 745); see also German Wikipedia. ^ Karl Rosenkranz, Hegels Leben, Duncker und Humblot, 1844, p. 19. ^ Beiser, Frederick C., ed. (1993). The Cambridge Companion to Hegel. Cambridge University Press. p. 419. ISBN 978-1-13982495-8. ^ Harris, H.S. (1995). Phenomenology and System. p. 7. ^ Good, James Allan (2006). A Search for Unity in Diversity: The "Permanent Hegelian Deposit" in the Philosophy of John Dewey. Lexington Books. p. 4. ^ The Spirit of Christianity and Its Fate"
^ Kai Hammermeister, The German Aesthetic Tradition, Cambridge University Press, 2002, p. 76. ^ (in Latin) G.W.F. Hegel, Dissertatio philosophica de Orbitis Planetarum. ^ a b G.W.F. Hegel, Philosophical Dissertation on the Orbits of the Planets. ^ a b Edward Craig; Michael Hoskin (August 1992). "Hegel and the Seven Planets". Journal for the History of Astronomy. 23 (3): 208–210. Bibcode:1992JHA....23..208C. doi:10.1177/002182869202300307. ^ Note that Weltseele zu Pferde is a shortened paraphrase of Hegel's words in the letter. The letter was not published in Hegel's time, but the expression was attributed to Hegel anecdotally, appearing in print from 1859 (L. Noack, Schelling und die Philosophie der Romantik, 1859, p. 153). It is used without attribution by Meyer Kayserling in his Sephardim (1859:103), and is apparently not recognized as a reference to Hegel by the reviewer in Göttingische gelehrte Anzeigen 2 (1861) p. 770, who notes it disapprovingly, as one of Kayserling's "bad jokes" (schlechte Witze). The phrase become widely associated with Hegel later in the 19th century, e.g. G. Baur in Reden gehalten in der Aula der Universität Leipzig beim Rectoratswechsel am 31. October 1874 (1874), p. 36. ^ den Kaiser – diese Weltseele – sah ich durch die Stadt zum Rekognoszieren hinausreiten; es ist in der Tat eine wunderbare Empfindung, ein solches Individuum zu sehen, das hier auf einen Punkt kontentriert, auf einem Pferde sitzend, über die Welt übergreift und sie beherrscht.Hegel, letter of 13 October 1806 to F. I. Niethammer, no. 74 (p. 119) in Briefe von und an Hegel ed. Hoffmeister, vol. 1 (1970), cited after H. Schnädelbach in Wolfgang Welsch, Klaus Vieweg (eds. ), Das Interesse des Denkens: Hegel aus heutiger Sicht, Wilhelm Fink Verlag (2003), p. 223; trans. Pinkard (2000:228). ^ a b Ludwig Siep, Hegel's Phenomenology of Spirit, Cambridge University Press, 2014, p. xxi. ^ Norman Davies, Europe: A History, 1996, p. 687. ^ Jon Mills, The Unconscious Abyss: Hegel's Anticipation of Psychoanalysis, SUNY Press, 2002, p. 16. ^ Steven Schroeder (2000). Between Freedom and Necessity: An Essay on the Place of Value. Rodopi. p. 104. ISBN 978-90-420-1302-5. Retrieved 2012-12-17. ^ Hegel, G. W. F. "Hegel's Philosophy of Right: Preface". www.marxists.org. ^ a b Zaleski, Pawel (2008). "Tocqueville on Civilian Society. A Romantic Vision of the Dichotomic Structure of Social Reality". Archiv für Begriffsgeschichte. 50. ^ Hegel, G. W. F. (1979). "Vorlesungen über die Geschichte der Philosophie". pp. 336–337. Retrieved 2008-07-01. ^ Hartnack, Justus (1998). An Introduction to Hegel's Logic. Lars Aagaard-Mogensen (trans.). Hackett Publishing. pp. 16–17. ISBN 978-0-87220-424-9. Hartnack quotes Hegel, Lectures on the History of Philosophy, Volume I. ^ Hegel, G. W. F. (1979). "Vorlesungen über die Geschichte der Philosophie". pp. 319–343. Retrieved 2008-07-01. ^ Copleston, Frederick Charles (2003). A History of Philosophy: Volume 7: 18th and 19th century German philosophy. Continuum International Publishing Group. Chapter X. ISBN 978-0-8264-6901-4. ^ The notable Introduction to Philosophy of History expresses the historical aspects of the dialectic. ^ "MDZ-Reader - Band - Von den Beweisen für die Unsterblichkeit der menschlichen Seele im Lichte der spekulativen Philosophie / Göschel, Carl Friedrich". reader.digitale-sammlungen.de. ^ In the 1870s and 1880s, Rev. T. R. Vickroy and Susan E. Blow - who were both minor associates of the St. Louis Hegelians - independently of each other translated various chapters from Göschel's book into English, and had their translations published in The Journal of Speculative Philosophy. The Journal of Speculative Philosophy (in print from 1867-1893) was the official journal of the St. Louis Philosophical Society. The St. Louis Philosophical Society - the organization which served as the hub of the St. Louis Hegelians - had been co-founded in January 1866 by 2 disciples of Hegel in America, William Torrey Harris (1835-1909) and Henry Conrad Brokmeyer (1826-1906). Rev. Thomas Rhys Vickroy (December 27, 1833 - April 19, 1904), a minister of the Methodist Episcopal Church, had been the first president (1866-1871) of Lebanon Valley College in Annville, Lebanon County, Pennsylvania. While President at Lebanon Valley College, Vickroy also held various professorships there. For example, one year he was Professor of Philosophy and the Greek Language and Literature, and another year he was Professor of Belles-Lettres and Philosophy. Susan Elizabeth Blow (June 7, 1843 - March 27, 1916) was an educator who in 1873 opened the first successful public kindergarten in the U. S. - in the Des Peres School, in the Carondelet neighborhood of St. Louis, Missouri. ^ Josephson-Storm, Jason (2017). The Myth of Disenchantment: Magic, Modernity, and the Birth of the Human Sciences. Chicago: University of Chicago Press. pp. 85–6. ISBN 978-0-226-40336-6. ^ Josephson-Storm (2017), p. 85-6. ^ Cormier, Youri. "Hegel and Clausewitz: Convergence on Method, Divergence on Ethics", International History Review, Volume 36, Issue 3, 2014. ^ Karl Löwith, From Hegel to Nietzsche: The Revolution in Nineteenth-Century Thought, translated by David E. Green, New York: Columbia University Press, 1964. ^ Hegel and Language, edited by Jere O'Neill Surber. p. 238. ^ Gustav E. Mueller (1996). Jon Stewart (ed.). The Hegel Myths and Legends. Northwestern University Press. p. 301. ISBN 978-0-8101-1301-5. ^ Robinson, Paul (1990). The Freudian Left: Wilhelm Reich, Geza Roheim, Herbert Marcuse. Cornell University Press. p. 156. ISBN 978-0-87220-424-9. ^ French philosopher Vincent Descombes introduced the term "post-Kojèvian discourse" to designate the period of French philosophy after the 1930s (Vincent Descombes, Modern French Philosophy, Cambridge University Press, 1980, pp. 158–9). ^ Williams, Howard; David Sullivan; Gwynn Matthews (1997). Francis Fukuyama and the End of History. University of Wales Press. pp. 70–71. ISBN 978-0-7083-1428-9. ^ B. Russell, History of Western Philosophy, chapter 22, paragraph 1, p. 701. ^ On the Basis of Morality. ^ Russell, Bertrand (1972). A History of Western Philosophy. p. 730. ^ Popper, Karl. The Open Society And Its Enemies. Routledge. p. 287. ISBN 9784624010522. ^ Karl Popper, Conjectures and Refutations: The Growth of Scientific Knowledge (New York: Routledge, 1963), 94. ^ "I do not argue that merely that we can understand Hegel as a Hermetic thinker, just as we can understand him as a German or a Swabian or an idealist thinker. Instead, I argue that we must understand Hegel as a Hermetic thinker, if we are to truly understand him at all." Magee 2001, p. 2. The secondary literature on Hegel is vast. The following references provide only a small selection of introductory English-language texts. For a more complete listing, see the external links section or the library resources box to the right. Beiser, Frederick C. (ed. ), 1993. The Cambridge Companion to Hegel. Cambridge: Cambridge University Press. ISBN 0-521-38711-6. Beiser, Frederick C., 2005. Hegel. New York: Routledge. Francke, Kuno, Howard, William Guild, Schiller, Friedrich, 1913–1914 The German classics of the nineteenth and twentieth centuries: masterpieces of German literature translated into English Vol 7, Jay Lowenberg, The Life of Georg Wilhelm Freidrich Hegel. New York : German Publication Society. Retrieved 2010-09-24. Harris, H. S., 1995. Hegel: Phenomenology and System. Indianapolis: Hackett. Hyppolite, Jean, 1946. Genèse et structure de la Phénoménologie de l'esprit. Paris: Aubier. Eng. tr. Samuel Cherniak and John Heckman as Genesis and Structure of Hegel's "Phenomenology of Spirit", Evanston: Northwestern University Press, 1979. ISBN 0-8101-0594-2. Kainz, Howard P., 1996. G. W. F. Hegel. Athens: Ohio University Press. ISBN 0-8214-1231-0. Kaufmann, Walter, 1965. Hegel: A Reinterpretation. New York: Doubleday (reissued Notre Dame IN: University of Notre Dame Press, 1978). Kojève, Alexandre, 1947. Introduction à la lecture de Hegel. Paris: Gallimard. Eng. tr. James H. Nichols, Jr., as Introduction to the Reading of Hegel: Lectures on the Phenomenology of Spirit, Basic Books, 1969. ISBN 0-8014-9203-3. Lukács, Georg, 1948. Der junge Hegel. Zürich and Vienna (2nd ed. Berlin, 1954). Eng. tr. Rodney Livingstone as The Young Hegel, London: Merlin Press, 1975. ISBN 0-262-12070-4. Maker, William, 1994. Philosophy Without Foundations: Rethinking Hegel. State University of New York Press. ISBN 0-7914-2100-7. Marcuse, Herbert, 1941. Reason and Revolution: Hegel and the Rise of Social Theory. Mueller, Gustav Emil, 1968. Hegel: the man, his vision, and work. New York: Pageant Press. Pinkard, Terry, 1994. Hegel's Phenomenology: The Sociality of Reason. Cambridge and New York: Cambridge University Press. Pippin, Robert B., 1989. Hegel's Idealism: the Satisfactions of Self-Consciousness. Cambridge University Press. ISBN 0-521-37923-7. Riedel, Manfred, 1984. Between Tradition and Revolution: The Hegelian Transformation of Political Philosophy, Cambridge. Rose, Gillian, 1981. Hegel Contra Sociology. Athlone Press. Russon, John, 2004. Reading Hegel's Phenomenology. Indiana University Press. ISBN 0-253-21692-3. Stern, Robert (2013). The Routledge guide book to Hegel's Phenomenology of spirit (second ed.). Abingdon, Oxon New York: Routledge. ISBN 978-0-415-66445-5. Stewart, Jon, ed., 1996. The Hegel Myths and Legends. Northwestern University Press. Stace, W. T., 1955. The Philosophy of Hegel. New York: Dover. Taylor, Charles, 1975. Hegel. Cambridge: Cambridge University Press. ISBN 0-521-29199-2. Wikimedia Commons has media related to Georg Wilhelm Friedrich Hegel. Redding, Paul. "Georg Wilhelm Friedrich Hegel". In Zalta, Edward N. (ed.). Stanford Encyclopedia of Philosophy. Houlgate, Stephen. "Hegel's Aesthetics". In Zalta, Edward N. (ed.). Stanford Encyclopedia of Philosophy. Lowenberg J., (1913) "The Life of Georg Wilhelm Friedrich Hegel". in German classics of the nineteenth and twentieth centuries. New York: German Publication Society.